I really debated a weekend post yesterday and then decided not to because all I did was watch TV and read and that's not the *most* exciting weekending I can imagine, but it's perfect for me. Scott hunted most of the weekend as duck season is almost over and, you know, wouldn't want to miss a day. But he took the dogs and I'm happy when they get to hunt. Sometimes a dog needs to borrow a coat. Over the weekend, we watched Big Little Lies. As in, all 7 hours in two evenings. I was a huge hold-out with this show this on purpose: I read the book almost 4 years ago and I loved it. It's a listening experience that I still remember because it was just so good. It led me to read the rest of Moriarity's books over a couple of years. I will always recommend her writing just because it's good. I didn't like that they changed the setting. The book's charm was that it took place somewhere I'd never been, yet was so relatable. The narrator made that book, and the character of Maddy especially, come alive. I could see what was happening. However, in the end, Monterey was a perfect second setting if one had to be picked. The way this miniseries was shot was beautiful and magical to watch with such attention to detail. Sometimes that can make or break a show*....and this made the show come into its own and be different than the book in a good way. I was initially insulted that they chose Nicole Kidman to play Celeste. Or, rather, that they allowed her to play Celeste because she was also a producer and I'm guessing threw a lot of money at the project in the same way Reese Witherspoon did. In the book, I think I remember, Celeste was described as being younger than Maddy and 'the most beautiful person ever' (or something like that). That is not how I would describe Nicole Kidman. She was FAR too old to play Celeste. I'm not saying she's old or she looks haggard or can't act or whatever (even though that Australian accent slipped out many times). I'm saying that she was not Celeste, as Celeste was originally written. However, in the end, I realized that this is a show based on a book and she did an amazing job of playing Celeste the character on the show and it didn't have to be the exact same Celeste as the book. The reason I really pulled the trigger on watching it (and adding HBO to my Hulu) was because Adam Scott was in it. That was the deciding factor because I will watch him in anything. Also, Alexander Skarsgard. We kept calling him the vampire. His days as Eric Northman were showing in this. The 6 year olds were also perfectly cast. Shailene Woodley usually bothers me greatly for many reasons, but she was also okay in this. Overall, this was really well put together. I didn't expect to like the music because I'm not a music person, but this was, again, SO well put together. The theme song is a great fit and just really makes me believe that it doesn't need to be a verbatim copy of the book, after all. Here's the full version of the song and here's a playlist of songs from the series, because they were all pretty impressive (and I'm not a music person these days). We've known a few military families to get stationed in Monterey...maybe someday! I finished Little Fires Everywhere last night. That's right. I came home on a school night and just sat and read a book because I wanted to finish it that badly. I started it last week, read it in bed while eating cereal on Friday night, and then spilled cereal all over myself (that was a mess). I read in snippets over the weekend, but then I read for 15 minutes yesterday while the students were reading...if I read silently while they read silently, they're better at it so here's to setting a decent example. And then I was ticked that I had to go out for recess duty and couldn't keep going. So I finished it at home and I would whole-heartedly recommend it. I don't remember the last time I felt that about a book (Whew..finally). I won't post straight up spoilers because it was just suspenseful enough to keep me reading, yet predictable enough to not hate parts of the plotline. I thought Elena was awful. She was terrible to Izzy and had some weird complex. I thought Izzy initially had the issues but NO WONDER with a mother like that. I wish Lexie had told Brian why their relationship ultimately ended. I was completely on the fence about Miribelle. I wanted the McCulloughs to have her because they did so much for her but I could see the other sad side of the story. I was thinking about how metaphorical that last page was...the parent/child thing really came full circle and I wonder, really, what would've happened after the book. I could see a sequel, actually. So, have you watched Big Little Lies? 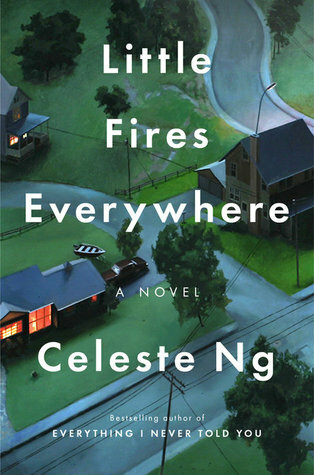 Did you read Little Fires Everywhere? I LOVED Big Little Lies and its soundtrack! Also, Adam Scott. Leon Bridges is at the Houston Rodeo this year, normally an event I totally avoid, but I learned of him through BLL and love him and may brave the crowds of cheap drunks. Little Fires Everywhere has been on my TBR forever and I currently have it on hold via three different library apps so I will get to it soon! I liked Big Little Lies the book. I watched a little of the show and it was...fine? I'm not huge on TV. I do love Leon Bridges. I am excited to watch it, I just read the book last month! Yay, finally is right!! I'm so glad you liked this book - I completely agree with all of your red points. That Miribelle situation in particular; SO heartbreaking no matter how you look at it! I still have to read her first book. I really enjoyed Big Little Lies, this is why I choose to not read the books first (if I haven't already read them) because then I get frustrated with casting and focusing too much on that to really appreciate what they are trying to create. Finally...whew :) I love Celeste Ng. I could never really tell anyone why. She makes me think about how I am as a wife, mother, sister, all around person in society. I will always read everything she writes! I'm glad you had some luck with reading. I want to watch it but I dont know how to get it - we dont have HBO - is it on something else now? I read Big Little Lies and loved it, and then was too worried to watch the series in case it didn't match up. I'm glad to hear you enjoyed it, in the round. I'm still retrospectively fangirling that I got to go to a talk by Liane Moriarty (well, it was more of an interview really) - she was excellent. I gather she doesn't do them often so it was definitely a treat. I looooved the music in Big Little Lies. Surprisingly, my least favorite actress in it was Reese Witherspoon. Just didn't fit how I imagined her. But she wasn't awful. The kids were great! I agree. I haven't watched Big Little Lies, though I kind of want to. When I was reading your reasons for holding out on it, I could relate. (Though, to be honest, I didn't actually know which character was being played by which actress. I thought Reese Witherspoon was Celeste for some reason. Shows how much I know!) I did really like the book, though, so I have a feeling I'll watch this at some point. I mean, why not? I read Little Fires Everywhere this month, and I love love LOVED it! I loved Celeste Ng's first novel as well, but this was even more amazing. It turned me into a complete emotional wreck more than once. i loved big little lies the book and was so-so on the tv series. i was annoyed at nicole kidman too, actually i was insulted by the whole cast. i mean, i like reese witherspoon but.. it's an australian book for pete's sake, and the only australian in it isn't even australian. rage. i know it wasn't set in australia, so i got over it. i just felt like the style of the tv show wasn't the same as the book. like i didn't get the same vibe. i don't know. i felt the same about Elena and Lexie/Brian. I was sad about their relationship. we read it for book club and we were split down the middle about Miribelle. I think the judge made the right decision but i think the author handled it really well with how the mother took her. that way both people 'won' even if not technically. both sides won, if that makes sense.